This one’s a staple back at mom’s place. 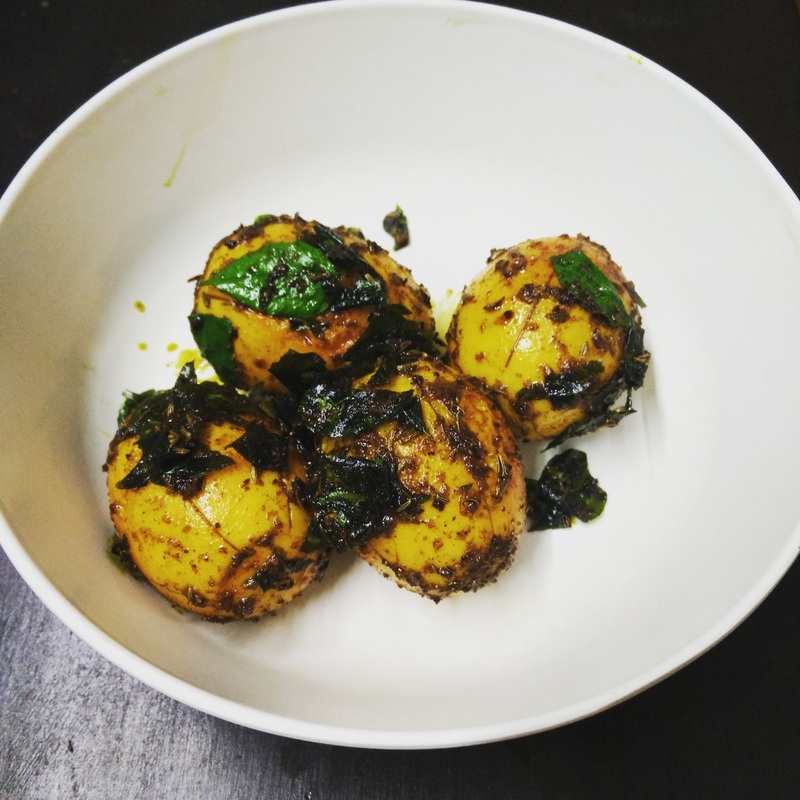 It’s basically eggs poached in a coconut based masala. Ideally it’s supposed to have potatoes as well, but I didn’t have any at home so I went with just the eggs. Most Indian egg curries have boiled eggs in a spicy gravy. But this one’s got them poached. I love eggs in a curry this way. The base of the curry is pretty much like the one for a kori (chicken) gassi. I went a little low on chillies though. Yesterday was spent cooking and over eating chicken biryani. I couldn’t get myself to cook more chicken today as well. Not in this heat. My kitchen doubles as a sauna during summer. That’s why the spinach curry and some egg masala on the side. The curry base was a mix of cooked tur dal and ground coconut with whole spices. If the masala and dal are made before hand, it’s a easier to put it all together. Blanch the spinach and keep aside. Save the water it was blanched in. Heat a pan with a tsp of oil/ghee and add 3 tbsp of the ground masala along with the dal. Mix well and add a dash of blanching water. Add the spinach, salt and chilly. Let it come to a boil and take it off the heat. Now heat some ghee in a pan for tempering. Add mustard seeds and let them splutter. Add the red chilly and the curry leaves. Once they splutter as well, add to the curry. Heat oil/ghee and add the cumin seeds and then the curry leaves. Add the onions. Add garam masala, turmeric, chilly powder and salt. Stir well. Once onions are cooked through, add eggs and mix. Take off heat and serve as a side dish. You’ve gotta love a well made creamy and smooth plate of scrambled eggs. Although, just the eggs scramble wouldn’t be enough to fill me up for breakfast. Ideally, I’d have covered a toasted bread with it. But since I’m off bread too (yes, it’s that kind of diet), I figured I’d top the eggs with something more ‘meaty’ or filling. Hence, mushrooms. Thanks to my Mangalorean lineage, I love coconut – in, on, under, over, however! 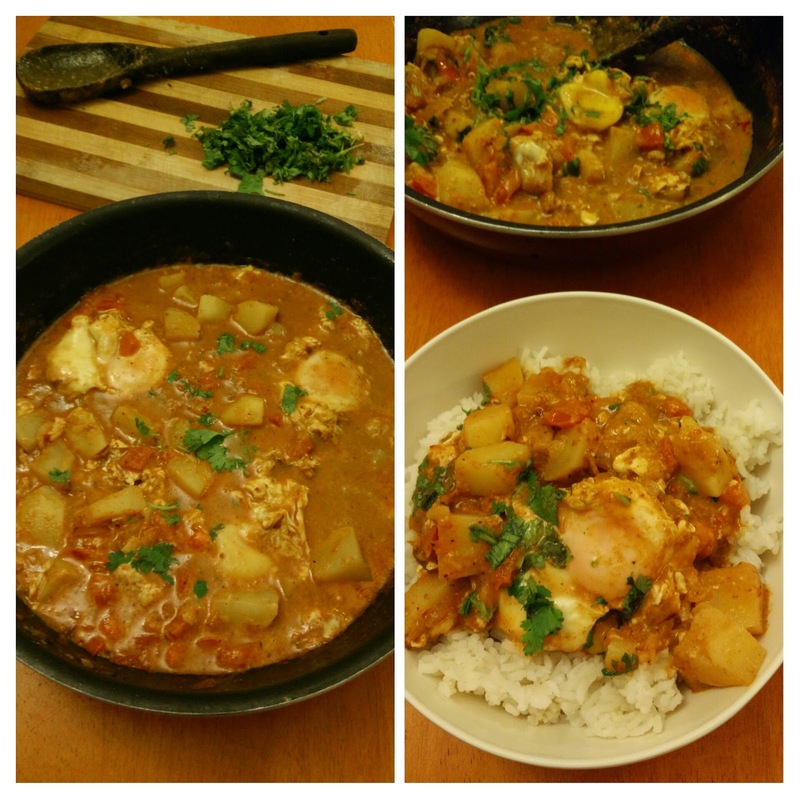 In this recipe, eggs are poached in the curry. I don’t know if we went to Israel or they came to Mangalore for a holiday, but there’s a Shakshuka connection somewhere in the eggs poaching in curry/sauce. Why this is a quick dish for me is that I make the coconut based masala and store it in the fridge way before. It becomes the base for my chicken, mutton and vegetable curry. It’s most convenient when you’re a working person, and all you need to do it cook the vegetables out in the masala. You can then either add any kind of stock or simply use coconut milk for some gravy. 1. Heat oil/ghee and add onions. 2. Let it turn golden brown and then add the curry paste. 3. It will turn darker in colour (2-3 mins) and then add the tomatoes and salt. 4. Add coconut milk and a cup of water to dilute the curry. 5. Let it come to a bubble before you add the potatoes. 6. Now gently crack each egg open into the curry, at four different spots. 7. Cover and lower the flame. Let it cook further for 5-7 mins or till the yolks are set. 8. Garnish with coriander and serve with rice. Crispy, toasty bread with bacon bits and a soft runny egg nestled right in the center. This one is very close to Rachel Khoo’s Croque Madame Muffins. However, I changed it to make it an easier breakfast dish. It’s always nice to try out different recipes by different cooks. Rachel’s recipes seem quite easy. Although some of the ingredients she uses wouldn’t be easily available here. Hence, bacon and eggs. 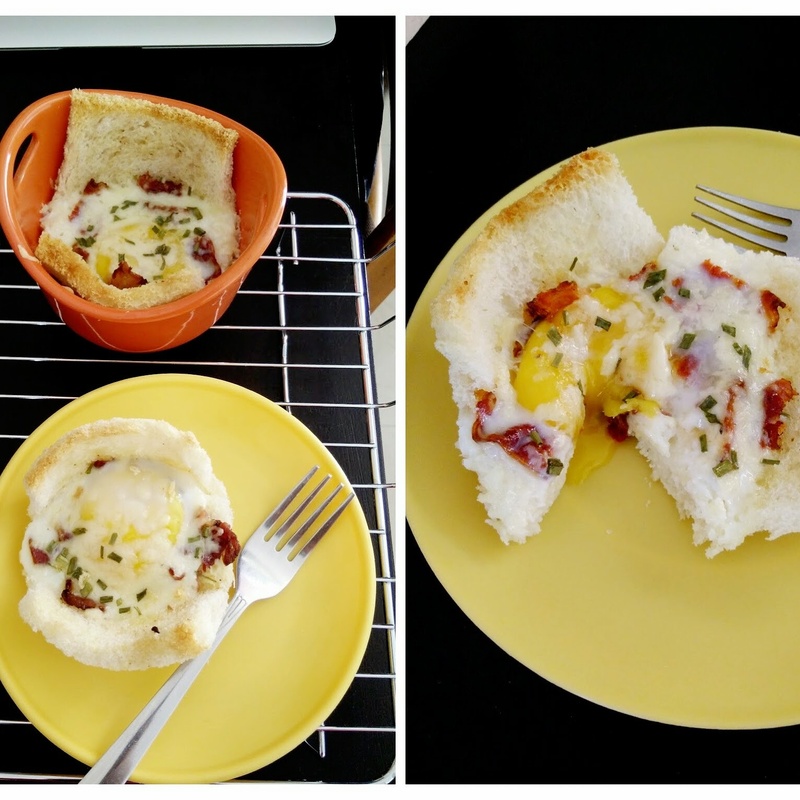 Bacon and eggs with cheese, in bread cups – everything is right about this. PS: Rachel is my cook crush, after Nigella Lawson, of course. 1. Spread butter on both slices and line it in your ramekin. 2. Cut up the bacon and line the bread with it, or place them whole. 3. Crack the egg into it. 4. Grate cheese (I used cheddar) on the egg. 5. In a preheated oven (180C), bake for 20 mins. 6. Garnish with any herbs you like or eat it just like that. I didn’t add any salt because there’s enough cheese and not to forget the bacon. This is an almost perfect side dish you can whip up in under 5 minutes (provided you have boiled eggs in hand). My original plan of Keema (or Kheema, I don’t care) Pav didn’t work out, I resorted to this dish. 1. In hot oil, add jeera and curry leaves. Wait for them to splutter. 2. Add the spice powders and salt along with ginger garlic paste. 3. Saute for a minute, before adding eggs. Goes well as a side with dal and rice or rasam and rice, or maybe a as a sandwich filling. My favourite bit is how the curry leaves get crispy in the end. Last night I made shakshuka and instead of having it with roti, rice or bread, I teamed it with steamed zucchini ribbons. This makes for a light and healthy dinner. The ribbons were made using a vegetable peeler. As simple as that. Then simply plonk them into boiling water for about 3-4 minutes and drain. Top with shakshuka and feta cheese (optional). This is embarrassing, but I believed I came up with this egg dish. Turns out, it was always around and it’s Shakshuka. Well, a kind of Shakshuka. Either way, it’s one of my favourite breakfast/lunch dishes. Eggs are always a hit. Be it fried, as an omelette, scrambled or even poached. This one is perfect for a weeknight dinner because it comes together in less than 20 minutes and with very few ingredients. Of course, you add more veggies and herbs to it to make it all the more delicious and filling. Scoop it with some pita or bread for best effect. But you can settle for rice too, like in my household. Leftovers can turn into breakfast. See what I mean when I said it was perfect. Simple. Straight forward. You can play around with the ingredients and make it your way. I just had some cheese and eggs sitting in my fridge and Upasana and I were trying very hard to battle midnight cravings for eggs. I did not want either of us to sweat over a stove that late. Well, we did a little bit eventually. Anyways, the result was good. Tummy happy, us happy and all in the world was good again. Ok I have gotten carried away, but we do really love eggs. Line the cooked veggies on the bottom of your ramekin or baking dish. Add the 1 tbsp of the cheese. Break 2 eggs into it carefully. Season with salt and pepper. Top it with the remaining cheese. Bake in a pre-heated oven (200C) for about 10 minutes or till the cheese melts. At this point it’s pretty much you and your bowl of comfort. Dig in and don’t leave the dirty bowl beside your bed!